WEST LAFAYETTE, Ind. — Purdue police are investigating the theft of traffic safety signs from two university golf courses. 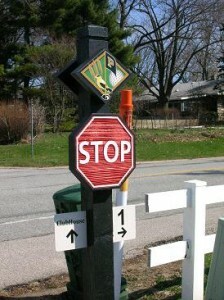 The stop signs taken from the Birck Boilermaker Golf complex and the Ackerman course on the Purdue campus resemble these custom-made wooden signs. Three stop signs were taken from exits at the Birck Boilermaker Golf complex. A 6-foot black signpost was cut down from the Ackerman course, which is across Cherry Lane from the Birck complex. All the signs were custom-made from wood and, together, are valued at about $1,700, Purdue Police Lt. Fred Davis said. Police believe the thefts occurred between 5 p.m. Sunday and 7 a.m. Monday. Anyone with information is asked to call the Purdue Police Department at 765-494-8221 or its anonymous tipline at 765-496-3784.